Egypt lies in northeast Africa, bordering the Mediterranean Sea, the Sinai Peninsula and the Red Sea. Around 3000 BC, Egypt emerged from the twilight of prehistory as one country, united under the single rule of a divine king. Before that, it is generally assumed that the country was divided in two parts: the North or Lower-Egypt or the Nile-Delta, and the South, between the Delta and the first cataract, Upper-Egypt. The king is portrayed wearing the royal nemes headcloth, the royal beard and the double crown, symbolizing his rule over Upper and Lower Egypt. The royal uraeus on his forehead protects him against all evil. His mission is to united the Lands of Egypt and bring spiritual unity to the people. The pharaohs worshipped the gods. Most of the Pharaohs were men. In the 18th Dynasty Queen Hatshesut came into power, and again at the end of the 19th Dynasty, Queen Tausert ruled Egypt for two years. The exact lineage of the pharaohs in many cases, remains unknown. Most married within their families to keep the bloodlines pure. Often a pharaoh might his daughter. Siblings would marry. Pharaohs had many wives and many concubines. There generally was a main wife. Pharaohs came to rule at very young ages. Many were murdered, their exact fates unknown. Their favorite pastime - from the time they ascended the throne - was the building of huge burial monuments or pyramids - some of which are found in the valley of the Kings on the West bank of the Nile. Monuments have been ransacked for leaving many empty - the remains of those supposedly buried within, a mystery. In the Late Kingdom, chaos ruled, and Egypt fell to the Persians who remained in power until the Greco-Roman Period. This was the time of the Macedonian Kings and the Ptolemaic Dynasty which concluded with the last Pharaoh, the famous Cleopatra VII. She committed suicide on August 12, 30 BC at the age of 39 thus ending the are of the dynasties. The Roman Era would not take control of Egypt destroying much of the sacred monuments created through the centuries. It was as if one cycle of time was ending (BC) as another was about to emerge (AD). the face of reality, religion, and the world at large would never be the same. THE FIRST DYNASTY - 3050 - 2890 B.C. SECOND DYNASTY - 3890-2686 B.C. THIRD DYNASTY - 2650 - 2575 B.C. FOURTH DYNASTY - 2575 - 2467 B.C. FIFTH DYNASTY - 2465 - 2345 B.C. SIXTH DYNASTY  - 2345 - 2184 B.C. SEVENTH - TENTH DYNASTIES - 2150 - 1986 B.C. i think you need more information on the actual old kingdom. 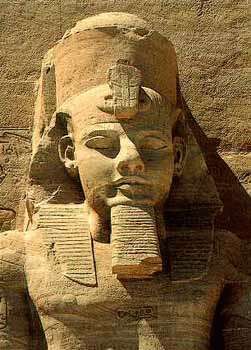 You need to create hyperlinks for the Pharaohs becaus ei am doing a project for school on Ahmose I and i need some info. on him. This page has a great list on pharaohs but theres not that much information. thanks a lot for the information bout the history of egypt. It really helps a lot,specially in my subject in History. great website but it would be better with some more pictures. Thank you! !